The following article is published in two installments. Images of maps have been a prevalent motif throughout the history of art, from the 6th- century Madaba Map in Jordan, through Navajo sand maps in North America, to the work of 16th and 17th century artists such as Johannes Vermeer, Hans Holbein, and many others. Since the 1960s, however, manifestations of map images in art have multiplied and diversified. Scenic (or landscape) maps, which are the focus of this essay, have come to signify an intermediate space between cartographic and painterly representation. A configuration that emerged simultaneously in various places worldwide, and was also discernible in Israeli art, it is a hybrid genre between a map and a landscape painting, between mapping and presenting the experience of landscape and the scenic panorama. Scenic maps are underlain by a principle of distortion, which undermines the system of signs, introducing mapping as a representation of the conquest of space in recent decades, in both Israeli and Palestinian art (including artists living in Israel, in the Palestinian Authority, and in the Palestinian Diaspora). Scenic maps became a widespread phenomenon; a field in which theory, criticism, and art intersect. While exhibitions pertaining to landscape—whether centered on painting, photography, or other media—are consistently staged in Israel, in the beginning of the 21st century local art critics identified a certain decline of this genre. Dana Gillerman, for one, wondered whether this was the end of the landscape painting genre in Israeli art, “as opposed to its flourishing in Palestinian art.” In search of landscape paintings which would continue the Eretz-Israeli painting tradition, critics undervalued the intermediate genre of scenic maps which transpires in-between landscape and territory. From the 1970s on, questions of identity and territory were rendered in sophisticated manners which crossed semantic systems, using images of maps and border signs in works in diverse media: painting, performance, installation, photography, video, textile, collage, and recently also digital art and dance. The first museum-scale show to introduce the cartographic-artistic encounter between the aesthetic and the political was “Borders” (The Israel Museum, Jerusalem, 1980; curator: Stephanie Rachum) which marked a turning point regarding landscape and territory issues among Israeli artists. The exhibition addressed the conceptual engagement of young artists with questions of language and society, while confronting the experience of life in a society rife with identities and a country without borders, which is nevertheless threatened by a sense of siege. A decade later, the exhibition “Routes of Wandering: Nomadism, Voyages and Transitions in Contemporary Israeli Art” (The Israel Museum, Jerusalem, 1991; curator: Sarit Shapira) redefined the relationship between Jews and territory based on philosophical models originating in writings by Edmond Jabès, Gilles Deleuze and Félix Guattari. It offered re-mapping of famous works, such as Itzhak Danziger’s “Nimrod” (1939), alongside new works indicating wandering and migration as a possible critical option against the territorialization of Jewish consciousness by modern Zionism, and its embodiment, among others, in traditional Eretz-Israeli landscape representations. In 2002 — the same year in which Gillerman’s review was published — Gideon Ofrat inaugurated a new exhibition space in Tel Aviv as chief curator. 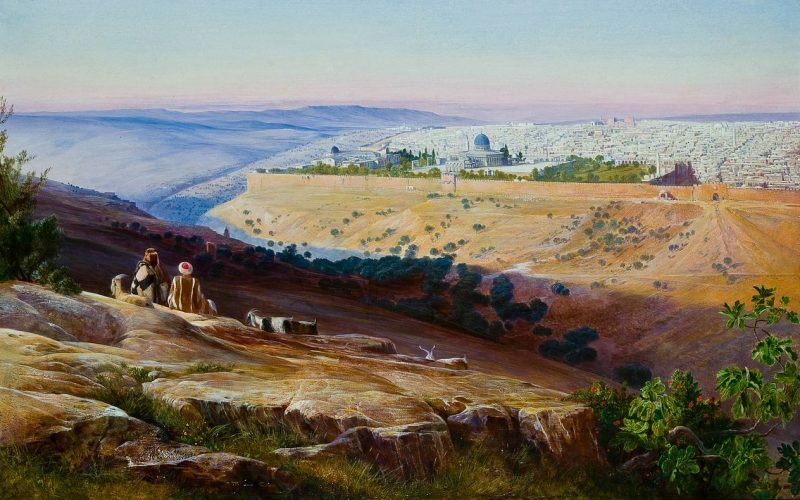 The inaugural show of Time for Art—Israeli Art Center, “The Return to Zion: Beyond the Place Principle,” juxtaposed works which would later be deemed scenic maps with grand landscape paintings, such as Elie Shamir‘s oil on canvas “Jezreel Valley” (2002). Not only did the landscape not disappear, it was re-defined, and one of the most intriguing among these new definitions was the category of scenic maps. Landscape paintings and maps have had separate cultural histories, during which they were regarded as two different types of spatial representation, although both articulated a process of territorial spatialization, determining the scope of control, power, and authority over a given space. The spatialization of territory derives from the construction of the physical landscape and establishing its character, whereby it re-materializes as a symbolic locus. Cartography, like any other text, is selective, and its interpretation is exegetic. Like other cultural texts, the map is a means to convey ideological messages. Despite the high scientific status of maps in the hierarchy of representations, they are selective representations of the world just like landscape paintings, and are even more effective than the latter in concealing the ideological and propagandist strata embedded in them. With the emergence of the great empires and nation states, landscapes and maps served as a means to create a new identity between people and places, as articulated in Saul Tchernichovsky’s well-known verse “Man is nothing but the image (literally, mold or form) of his native landscape.” And since the landscape of the homeland is a form or matrix in itself, the map and the landscape are both a signifier and a signified. In the tradition of European painting, the relationship between man and landscape is founded on the existence of a single observer and an object observed from a single vantage point. In this context, there are two visual conceptions, whose origins differ: that of painting and that of mapping. The landscape is observed from a single point and translated into a perspectival system which presupposes the existence of a single observer who stands at the right distance to recreate the spatial illusion. Painting is tantamount to a window onto reality, and linear, scientific perspective, as formulated by Leon Battista Alberti in On Painting (1435), constitutes a rational image of the world which acknowledges the categories of object and subject and regulates their interrelations. It is not a pluralistic world view that acknowledges several concurrent viewpoints and observers. The observer remains outside the picture, so to speak, and the picture is constructed in relation to him, thus including him in it. Landscape and observer thus assume one another’s existence. Furthermore, while the landscape requires an onlooker who observes from a fixed point, the map calls for active reading—namely, an active subject who puts it into effect via reciprocal transitions between the conceptual and the physical, between vision and motion. This affinity is linked to the fact that the acts of measuring and territorial demarcation, translated into graphic signs and scales via the act of mapping, originated in “physical” measurements: foot, cubit (forearm in Hebrew). Hence, the mapping and cartographic representation of a territory are perceived by contemporary artists as signifying a relationship, rather than as an image per se; a relationship between body and territory in the phenomenological and political senses. The 1980s saw the emergence of a new theoretical discourse about landscape. Its architectural planning, design, and representation were at the core of cultural studies which regarded landscape as a crucial intersection of the real and the imagined. Following Mitchell, Wood, Cosgrove, and others, who argue that landscape images are an ideological device and a historical configuration, the landscape is laid bare, and its exposure reveals the power systems that shaped it. Yael Guilat is Head of the Program of Multidisciplinary Studies in the Humanities and the Arts at the Faculty of Graduate Studies with the Oranim Academic College of Education in Tivon, Israel. Her work focuses on intersections between gender, identity and memory, especially on its manifestations in the public space.